International Day for Disaster Reduction, the day intends to raise awareness about various disasters, the risk they face during disaster and also how the communities across the world reduce their exposure to disaster. 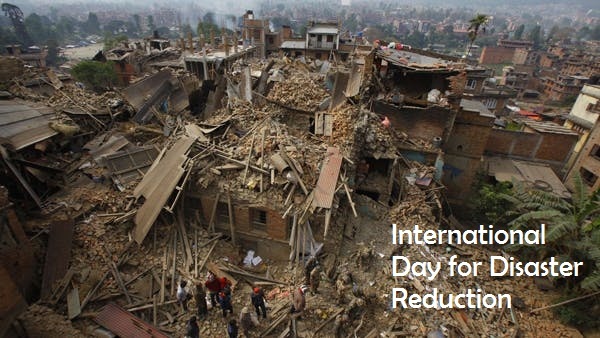 WHEN IS INTERNATIONAL DAY FOR DISASTER REDUCTION? During some natural disasters like earthquakes, droughts, tsunamis, heavy flooding, or cyclones many people across the world loss their home,assets,basic essentials and also it may causes the economic balance of the country, so to overcome this the UN acknowledges that education, training, and information exchanges are effective ways to help people become better equipped for withstanding natural disasters. Thus the UN General Assembly designated 13th October as the International Day for Natural Disaster Reduction. Hello, Contact me on sreerejiths@gmail.com.